Yeah, but: Is it only a photographer thing? The Long Version: There are only two comic strips that I read on a regular basis, and the only one that I absolutely must read every day is Aaron Johnson's What the Duck. 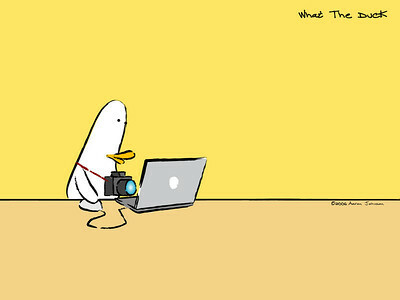 It's following the career of a photographer who happens to be a duck - or a duck who happens to be a photographer - as he struggles through the difficulties of his profession. There's a healthy cast of characters, and after almost 500 episodes, the strip shows no sign of sharks. This is going to be a short review simply because there's really not much that I can add. The humour has a large amount of truth to it, and it's not always a happy truth, but it's mostly drawn from the reality of being a 'working' photographer. A clever quirk is the way dialog always covers the faces of any actual people, or they will be too tall to fit in the frame. The hero is a duck, and ducks are short. The way Aaron Johnson never loses sight of the oddity of the situation, while still keeping it unremarkable, is a big part of the charm of the strip. I've been following the strip for ages, to the point where "Chimpin' ain't easy" is part of my regular vocabulary, and my girlfriend has a list of WTD merchandise that I would like as gifts. (I'll forward my postal address to anyone who wants to send me a Duck U messenger bag.) It's quirky, well written, and consistently funny. It's also free. What more could I ask for? Here's the link again: whattheduck.net. For those who remember the beginning of this review, the only other comic strip that I make an effort to read is Garfield Minus Garfield, which I have also reviewed. The image used to illustrate this review is copyright 2006 Aaron Johnson, and is used with permission. It's cool to get an e-mail from someone famous. You should also read Lio and Cul De Sac.